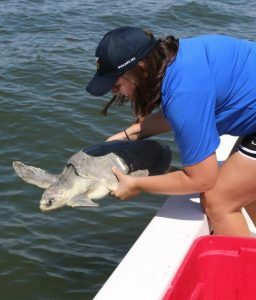 My research is centered on the physiology of marine mammals and sea turtles, particularly as it informs their conservation. I graduated from Cornell University in 2016 with a B.S. in Animal Science. While my undergraduate studies were primarily focused on the anatomy and physiology of domestic species, I knew early on that I wanted to work in the field of wildlife conservation. A summer spent rehabilitating stranded seals and sea otters at the Alaska SeaLife Center confirmed my budding interest in marine mammals, and I spent my final year at Cornell focusing on ecology and marine biology. After graduating, I spent six months rescuing and necropsying manatees as an intern with the Florida Fish and Wildlife Conservation Commission. From there, I accepted a position as a Stranding Technician at the Institute for Marine Mammal Studies where I responded to strandings across the Mississippi Gulf Coast, rehabilitated sea turtles and cetaceans, and participated in boat based photo-identification surveys of bottlenose dolphins. Over the last 4 years I have responded to over 250 marine mammal and sea turtle strandings, and I am excited to now be back on the West Coast working as a stranding responder and data manager for the Moss Landing Stranding Network. 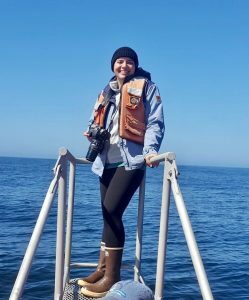 I joined the Vertebrate Ecology Lab here at MLML in the fall of 2018, and I am thrilled to be studying northern elephant seals under the guidance of Dr. Birgitte McDonald. My thesis research is part of a large collaborative NSF-funded project examining the diving physiology of these large pinnipeds. Elephant seals are capable of routinely diving to extreme depths and our research will employ a series of novel biologgers to assess their oxygen management strategies and the scope of their dive response.